We need to properly hydrate in order for our body to function properly. But most people forget to hydrate and will not drink the required number of glasses of water to make sure that their body functions at its optimum best. Reminders are the best solution to forgetfulness and it is this same principle on which the HydraCoach Intelligent Water Bottle was made. The HydraCoach Intelligent Water Bottle is an awesome hydration system that solves the problem of tracking hydration levels for any kind of activity (or even when you’re not doing one). The styslish bottle features an onboard computer (yes, even bottles are getting computerized) that performs a number of functions, the main one being to remind the user when he needs to take a drink of water in order to meet the daily water requirements of the body. 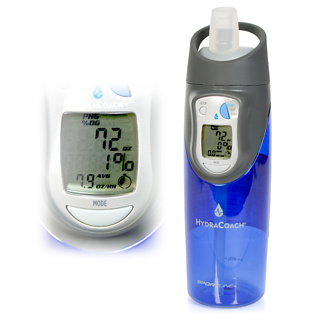 The other features of the HydraCoach Intelligent Water Bottle include informing the user of the required water intake of a person based on his weight and on how long his exercise routine is. The recommendations are so accurate that it will even compensate for such factors as the altitude, the level of heat and even if the user is pregnant (pregnant women have a very different water intake requirements). The HydraCoach Intelligent Water Bottle has a capacity off 650 ml., a bit small (I can usually drink more than a liter of water a day) so hopefully the makers of this product will upgrade the capacity of the bottle to something more substantial. The body itself looks pretty cool and nice-looking enough that when you bring it out it will actually look quite presentable. And with the LCD screen on the bottle itself it will surely turn heads. Just be quick to assure people that it’s not some kind of terrorist device.